For almost 100 years, as it is with many New England barns, this was, until the late 1960’s, a fully-functioning dairy barn. Ah, but it was the “old” dairy barn that housed about 5 or 6 head of cattle, un-like today’s mega-farms of 100’s. Those were the days when cattle roamed fields and pastures, grazed contentedly during the day and came back to the barn to be milked… stool and bucket. I came upon it in 2013, years after the poor old structure had been, very much, ignored and almost all but abandoned, save for the moments when the weather-aged doors would be pulled open and something other-wise useless got tossed into the darkness and the doors swung shut again until the next item needed hiding. The following are photos of reclamation and re-use. The process was slow because there was no particular interest in re-use other than a statement “It would be nice to have it back again, if only as a tool-shed or work-shed.” There was no budget and no resources other than imagination, some time and resolve. Some 40-plus years of accumulated refuse, old chafe, hay, farm and garden equipment and some “mystery materials” had to be removed. But… well… the following photos speak for themselves. 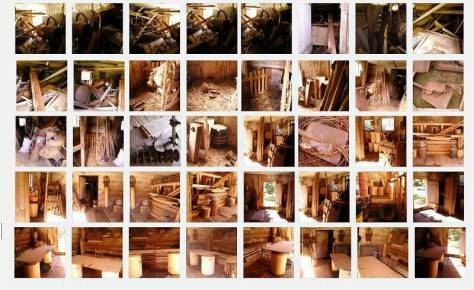 The interior lower level in the back of the barn was attacked first. Then, the upper level got cleared and tidied, followed by the lower level front. And when weather permitted, the out-side of the barn was cleared, returning access to the rear as well as the front. The results? All said, every moment was indeed, very much well worth the investment of time, energy and sweat. The upper level became a place of quiet retreat in the Summer months. The lower level was surely a great space where other work was done (for example, the refinishing of some old chairs that were uncovered during the initial clean-up… seen else-where on another page here). And the lower front was cleared and opened for storage of tools and yard furnishings as well as property maintenance equipment.